The Looe Guildhall Collection asked the Art Detectives to help work out when ‘HMS “Looe” Approaching Looe Island, c.1740’ was painted. After doing a quick web search of other marine and coastal subjects by the same artist Andrew Greg suggested that the work was painted in the second half of the twentieth century. Without prompting, the niece of the artist started to comment on the discussion. Sheila Honeywill gave the dates of the artist, her uncle, Roy Stringfellow as 1921–2008. Sheila was also the first to suggest more accurate dates dates for the painting’s execution of between 1955 and 1980. Quickly the Art Detectives had established an approximate execution date; however the ‘c.1740’ part of the painting title began to come under scrutiny. 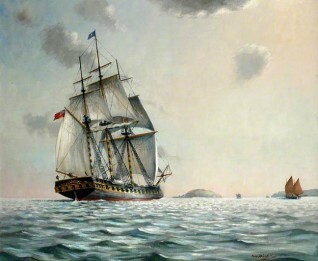 Bruce Trewin commented on the subject of the painting and noted that it is an early nineteenth-century 28-gun frigate. Maritime Group Leader, Pieter van der Merwe agreed, but noted that there are another six on the poop and there would be other forward and four chase guns (two each bow and stern), so it would be classed a little bigger. However the title of the work was retained. A description was added: HM frigate 'Looe', 44 guns, was built on private contract at Limehouse, London, was launched in December 1741 and entered service in early 1742. Early in the morning of 5 February 1744, while engaged in anti-Spanish operations in the Florida Keys, she ran onto a reef off the island since then known as Looe Key. Before the crew escaped in boats and another vessel, they set 'Looe' on fire to avoid capture. This is a mid-to-late-twentieth century painting by an artist listed as working in Cornwall and is presumed to represent the ship just before she was wrecked. When was "HMS 'Looe' Approaching Looe Island, c.1740" painted?